The various ramps on this machine are a single piece of black plastic. 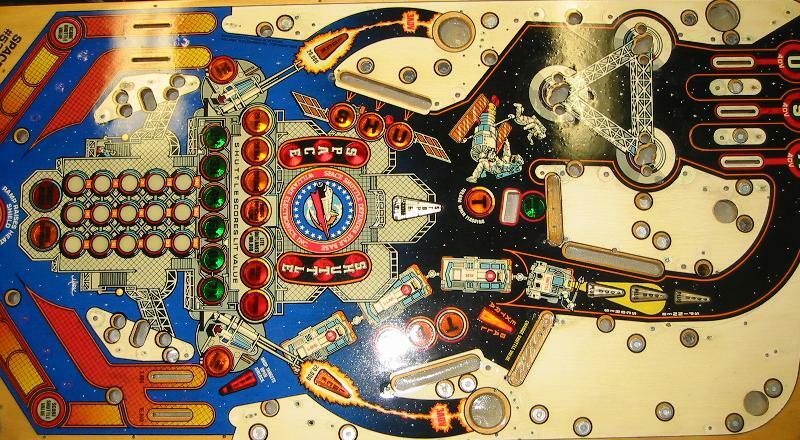 The ones from Playfield B and C had been cracked and some small parts missing due to the numerous ball strikes and repair hacks over the years. I decided to use the worst one of them to develop a technique for repairing them. I found that using sticky fiberglass mesh tape and two-part epoxy were very easy and effective. This tape is normally used for drywall seams, and is very strong and allows the flow of material (dry wall mud) through their opening. 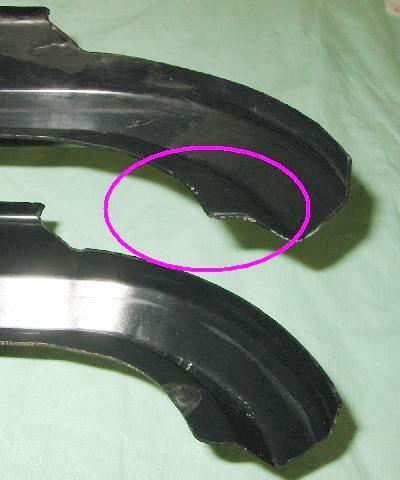 Many ramps on newer machines are clear and can be flame polished to their original luster. Although the Space Shuttle ramps cannot receive this treatment (it bubbles on application of heat), the black plastic is more forgiving to repairs as the back is hidden, and the repairs can be painted black to match the rest of the ramp. 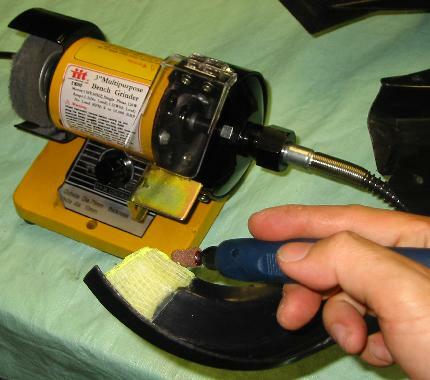 Sand the area with rough grit sandpaper such as 60 grade. Wipe down the area with alcohol to remove sanding dust and oils. Repeat several times. Apply sections of mesh tape using the sticky feature to hold them in place. Use two layers for high stress areas offset by one half the grid spacing. 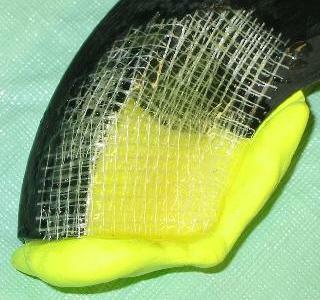 Apply epoxy by pressing it with a flat blade through the mesh holes to get the epoxy onto the black plastic. When dry, sand and then paint with flat black acrylic. can see a big chunk missing from the front of the ramp. 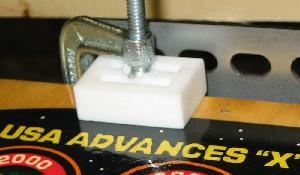 raising the playfield and pushing the ramp against the metal bracket that holds the field down. and the epoxy, it feels much stiffer and stronger. This repair technique was modified to reconstruct the exit of one of the ramps that had a large piece missing. After some thinking about it, I hit upon the idea of using "Model Magic" to form a mold. This substance can be purchased in an airtight container, and is soft and moist. After it dries (takes a few days), it firms up, but does not harden completely. This is an important feature as I could then transfer the mold to the broken ramp, which could be shaped slightly differently. After I lined the mold with clear tape as a release agent, I pressed it into the broken ramp. Then I used several layers of mesh tape and epoxy to reconstruct the missing portion. After curing, the mold was removed, and I then sanded, trimmed and painted as before. Reconstruction of the exit spout on the ramp using "Model Magic". flashing cannot be used here as the new substrate because of the complex compound curves. to trim the repair to match the reference ramp. After this: sand and paint. is the left part of the ramp exit. The black shiny ramp is difficult to photograph. it will not see any ball strikes. In preparation for this important step, I sanded the playfield with 1000 grit sandpaper. After some sanding it was apparent that the acrylic touchups are much softer and protrude above the existing paint. 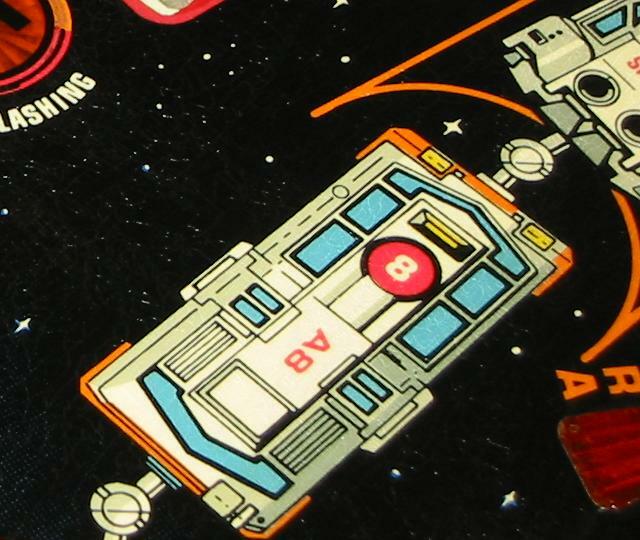 As a result, I had to retouchup some places, especially around the inserts in the middle of the playfield. The lesson here is clear: sand before you touchup. This was prescribed in the various write-ups I read, but I overlooked that point. I did not sand very much near the ball locks in order to prevent any damage to the overlay and the touchups. After retouchup, I sanded more selectively. I then wiped down the entire field multiple times with a clean T-shirt dampened with Naphtha. This is the final cleaning to remove all oils, waxes and sanding dust. I found that Magic Eraser does not work well because the sanding dust does not get picked up. It will dry in streaks. I found that the bulb openings in the field are 1/4", and I could use #10 washers to cover them up. In some places where the #10 washers are not usable, I found that old coil sleeves are perfect for covering up the bulb sockets. See the left edge of the picture below. I use the latter method sparingly as they make sanding between coats more difficult. didn't clearcoat, but only waxed the playfield that these would be accentuated. This gave me not much choice but to clearcoat. less visible. I used the Varathane that is recommended by Clay. playfield was dry to the touch. 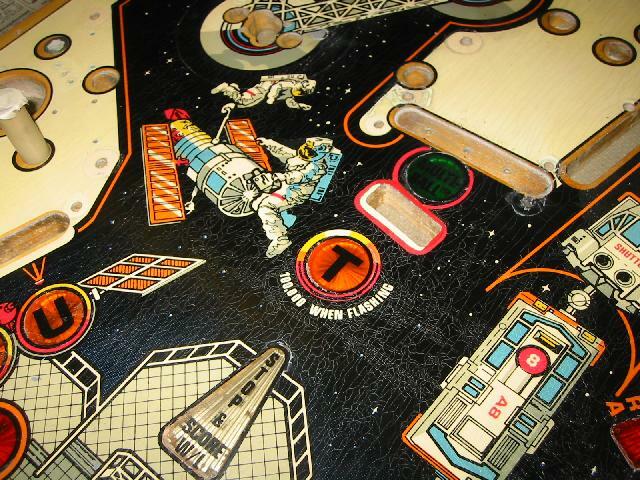 In applying the clear, I learned that the technique that worked best for me was to make sure the playfield is completely level and then to apply heavy wet coats to allow the clearcoat to sort of flow in a sheet. Apply enough so that it starts to just cloud a little. This clouding will disappear and the clearcoat will dry transparent and smooth. During the spraying process, if any texture remains on the surface, hit that area with another burst. After about half an hour, the clearcoat will be dry to the touch. The exception is the first coat, as it ought to be applied lightly to prevent the bleeding of the overlays printed on decal paper. It is fairly easy to tell areas of the playfield that are even slightly depressed from the others as they will be the last to uncloud. 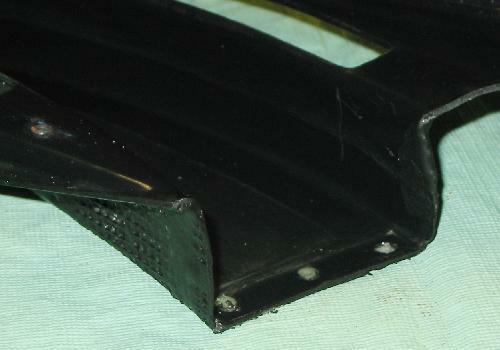 For example, one can see a thin (0.1") ring of cloudiness around each pop bumper. This ring coincides with the edge of the circular mylar that protected the pop bumper area. Between each coat, I sanded with 600 grit (after the first coat, I used only one pass of 1000 grit). 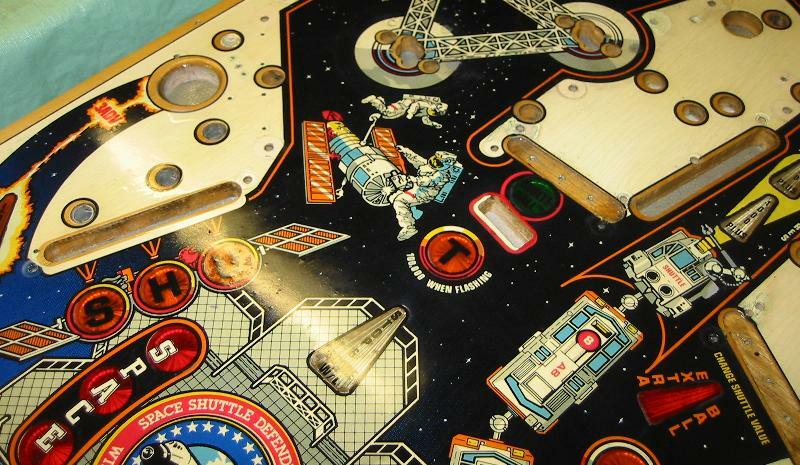 Afterwards, I wiped the playfield carefully with a T-shirt dampened with Naphtha to remove the sanding dust. 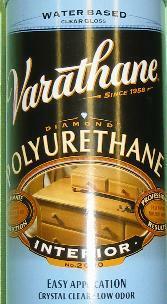 On a separate test plank, I found out that the IPA (alcohol) dissolved the Varathane. I like the thought of a readily available solvent that will leave the original paint unharmed, but that will remove acrylic paint and the clearcoat in case I need to restore the playfield in the future. It remains to be seen if the Varathane will still dissolve in alcohol after a long time. Each coat was allowed to dry 24 hours before the next one was applied. Don't forget to spray the can upside down to clear the nozzle after spraying. These pictures were shot at the end of the drying period. of Spaceship 8. This area looked really bad before any clear coat. Click here for a picture of this area before clearcoat. After three coats. The problems are now noticeable only in high magnification. able to hide the crazing and imperfections in the paint was completely unexpected. After spraying five coats, the surface looked great except there were still a few inserts where their edges showed a thin depressed ring. This was left over from when the playfield was bare, and some inserts had wear around them. I spent the next two days filling in the edges with a small paintbrush dipped in the clearcoat and then sanding them flat with the rest of the playfield the next day. I obtained small amounts of clearcoat by spraying into a small glass bottle. Finally, I sprayed the playfield with a sixth and last coat. 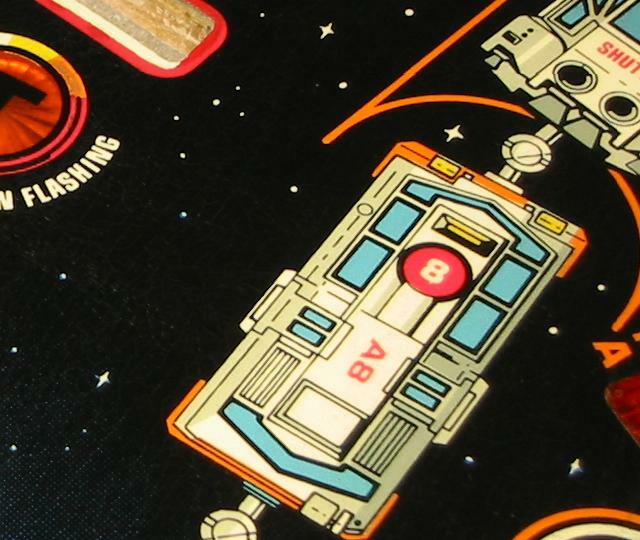 Once I was done, the inserts were flat with the rest of the playfield. Five minutes after the final (sixth) coat. Note the slight white clouding. This shade is my gauge to tell how thick to apply the clear. in the Clear Gloss version. The project required two cans. Another shot of the playfield. I am very pleased with the final result. The result have exceeded my expectations. After waiting three weeks for the clearcoat to dry, I performed the finish work here. with clearcoating, especially Clay Harrell. 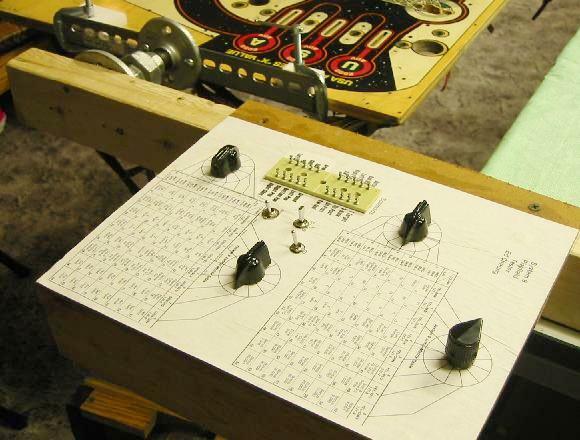 While the playfield dried I started to reassemble the playfield actuators (slingshots, flippers. popbumpers, etc). I ordered various new parts from pinballlife.com and pinballresource.com such as coil sleeves, a new rubber kit, flipper parts, etc. 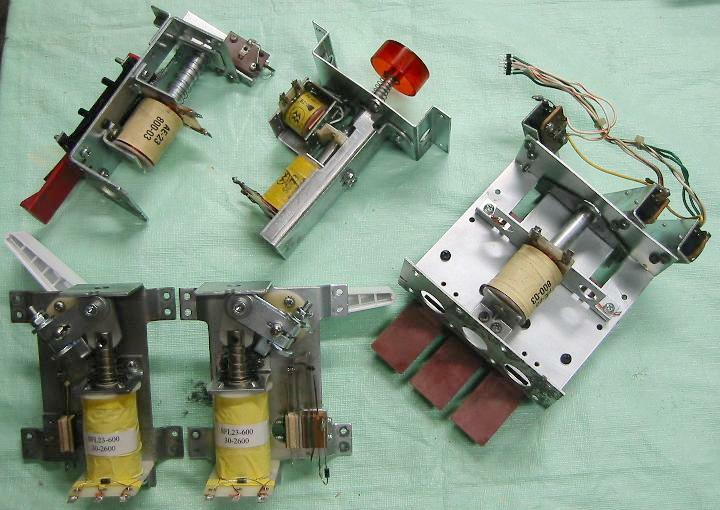 Each of the actuators were completely disassembled, sanded with 400 grit paper, tumbled in the vibratory tumbler overnight, and then reassembled with new coil sleeves. Some coils were replaced, and the targets had new decals applied to them. almost all of the parts on the flippers are new. Note the connector I devised for the switches on the 3-bank drop target. This allows me to reinstall it more quickly. without fear of marking the clearcoat. The white mass in the photo is the teflon block. Since I did not know the operational state of Playfield B when I received it, and also due to the many parts that were removed and refurbished, I decided to build a standalone playfield tester. If I had miswired a solenoid, it could cause damage to the CPU board of the machine. Also, the machine is several feet away from the playfield rotisserie, and it would be clumsy to move the two closer for a test. 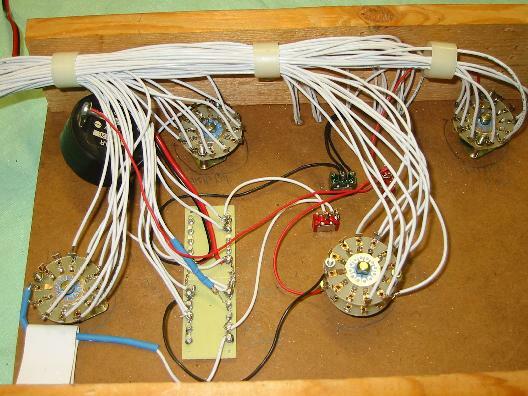 The tester will allow me to verify every switch, lamp, solenoid and associated circuitry and harnessing. I was surprised to find no similar device when doing a Google search. matrices just like the CPU would. In addition, solenoids and flash lamps can be fired individually. cover overhangs the left side of the box. The purpose of that is explained below. a playfield that is still installed inside a machine. 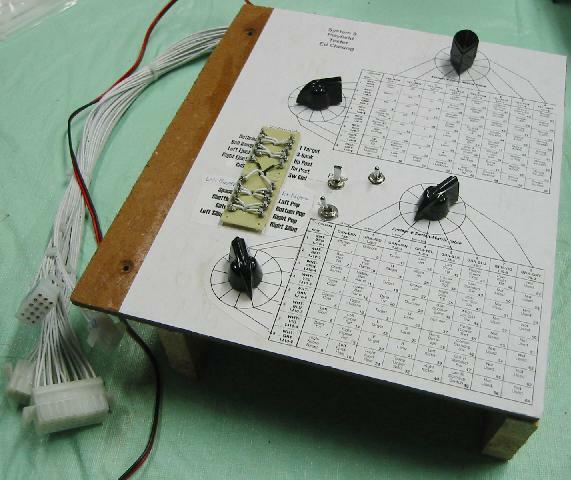 As one can see in the above image, the tester features a copy of the two matrices from the user manual of the Space Shuttle. A particular switch or light bulb can be selected by turning the row and column selector rotary switches to point to that item. Power is provided by a separate current limited adjustable power supply so that I can limit the amount of current to prevent damage should there be a short in the wiring. Note that the printed matrix in the user manual has colors associated with each row and column (see picture below). 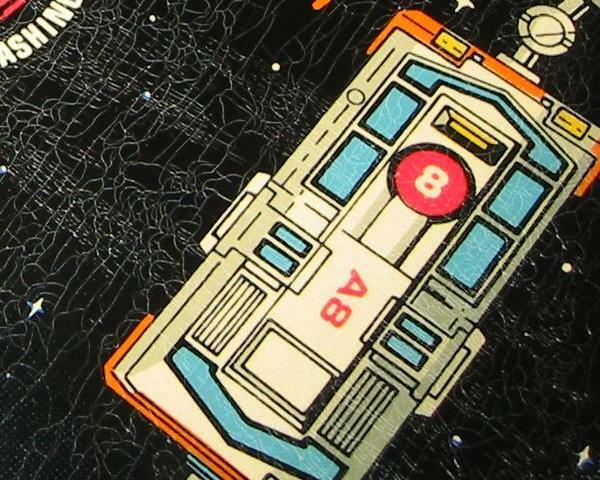 It turns out that these colors are those of the wires on the playfield. 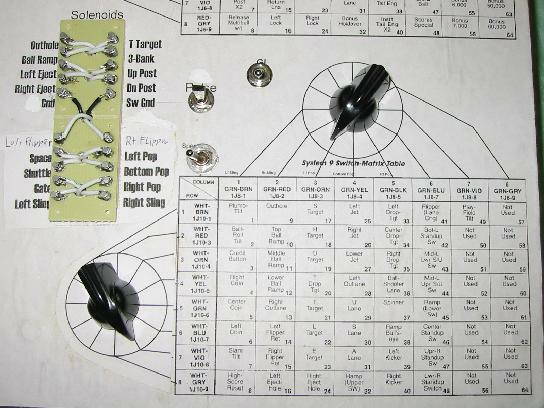 So although there was no schematic of the playfield itself, I could tell how to connect the selector switches based on the color mentioned in the columns and rows. When I first fired up the matrix, I found that few of the lights worked; perhaps 25%. 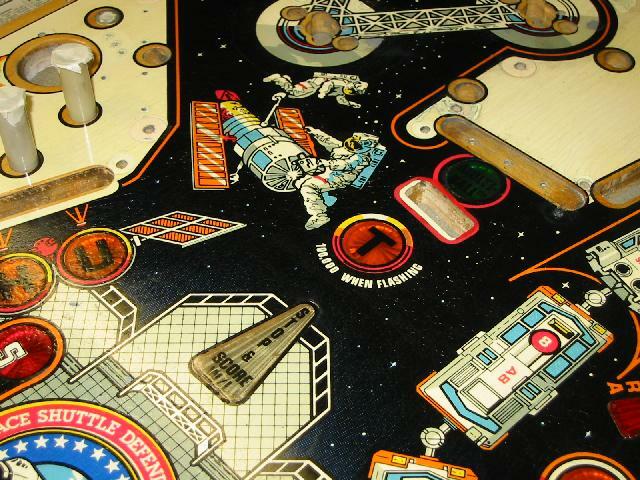 Considering the large amount of work to be done, I was glad to have the tester so that I could work on the playfield from the comfort of my work chair instead of standing next to the pinball machine. matrix of the user interface panel. One of the few lights that worked is shown in the photograph. I would agree that this tester is very "SPECIAL" 8-). switches that make intermittent contact and that need to be cleaned. 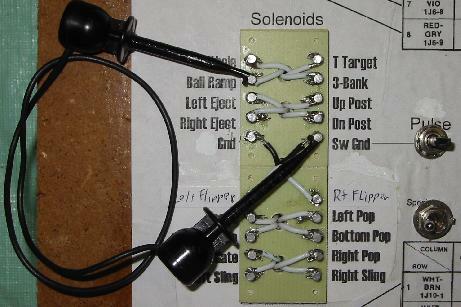 toggle to fire the solenoid. BLAM! Solenoids are tested by grounding their return terminal. A momentary switch is provided to allow pulsed operation. I also intend to test the diodes on all the coils by reversing the polarity of the power and verifying that the coil does not fire. This is important as an open diode will not suppress the large EMF kick of the coil, and could damage the driver on the CPU board. Update: In February 2006, I sold the above playfield tester for $60.